JUST around that curve in the gravel road, beyond the cluster of heavy plum trees and inside the chicken coop-turned-cottage, there’s a lot of commotion going on: the whirring of a sewing machine, the swish of a broom, the patterns of drums and tambourines, the shouts of calls and responses, the shrill of flute song, the squeals of girl children dancing and fighting… yes, the FAUN FABLES family is getting ready to head out for the road ! Songtellers DAWN McCARTHY and NILS FRYKDAHL are based in the country again, and all manner of elements are in the mix; new hens, new songs, wind storms, rusty metal, electrical wires tangled in the trees, children in the rafters, word-shearing. While the sun is at its hottest, they’re packing up the best of it – guitars, costumes, Mother Goose, a bookshelf, newly fitted van sheets & songs, a nanny, a hat with a bell, a blue parakeet, whistles to blow while they dance down the street – preparing to play twenty+ towns with a stop in POLAND somewhere in the middle. NOTABLY, they’ve uncovered some obscure archival recordings of Dawn, circa 1997-2000; solo and exploring, in transition and travelling, setting up the bedrock that Faun Fables would grow out of. This upcoming Drag City release, for now only on cassette, ‘DAWN McCARTHY/TRAVELLER RETURNING,’ will meet them somewhere on the road.. you might strike it lucky in your town! STAY TUNED .. They will also be armed with some new copies of MOTHER TWILIGHT… out of print longer than we can recall ! 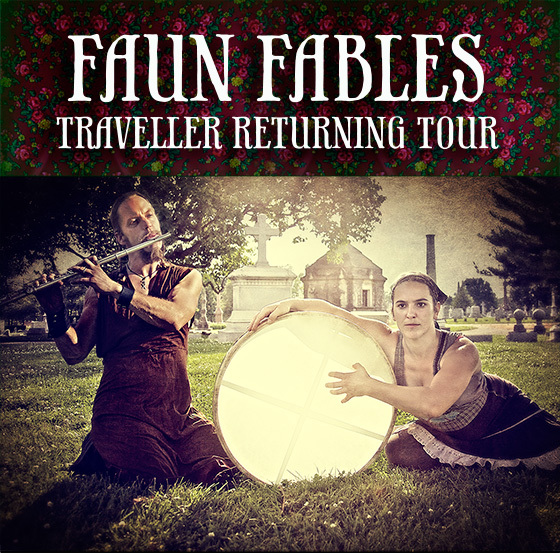 The word about town is that FAUN FABLES have been secretly making a NEW RECORD, their first in five years since their progeny became a brood; drawing upon all the fragments and molasses, the fruit-laden circus, the ungodly hours of song making that parenthood crowns. For now, they’re letting out ONE SONG from it (‘O my stars’) with a VIDEO, by Catherine Hollander, ready to debut in the coming days. . an iTunes version will be available for purchase with the video release. . STAY TUNED ! In NILS NEWS ~~ characters characters characters ! And UPCOMING.. he will be an underworld god in The Shotgun Players’ EURYDICE …! And it’s here we’ll leave you, with the plums starting to drop, and hope to meet up in one of the following towns ! 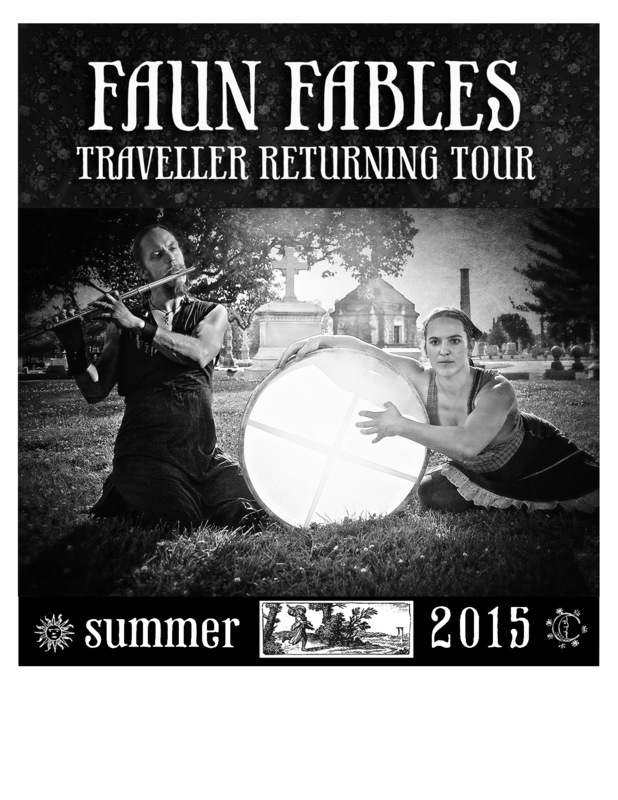 Be a part of the Faun Fables Street Team for our 2015 National Tour! Download the Tour Poster and help spread the word: poster your town, wallpaper your room, wrap your to-go sandwiches in!